What is a "Bone Density Test?" A bone density test, also known as a DEXA scan, stands for Dual Energy X-Ray Absorptiometry (also known as DXA) and is the most widely used test to measure bone mineral density. The measurement reflects the fact that the denser the bone, the less X-rays pass through. Usually the more dense your bone, the stronger it is, and the less likely it is to fracture. If you’ve ever had an X-ray, the process is very similar. A DEXA machine uses low-energy X-rays and sends two different sources (thus the ‘D’ for “dual” in the name) through the bone in question. The two different X-ray sources are used to double the accuracy in measuring your bone density. So, your bone blocks some of the X-rays. And the more dense your bone is, the less X-rays pass through to the detector. The amount of X-rays coming through the bone from each of the two X-rays is sent to a computer, which calculates an average score for the density of your bone. A DEXA scan is more accurate than regular x-rays or CAT scans and requires less radiation exposure. See more about radiation and DEXA scans below. Central DEXA looks at your whole skeleton, paying special attention to your spine and hips. These machines are usually found in hospitals and medical centers, but there are some in doctors’ offices. Peripheral DEXA are smaller, and focus on your extremities, like your fingers, ankles and wrists. You often find peripheral DEXA machines in a doctor’s office or smaller medical exam facility, though sometimes you see them at health fairs or even at bigger shopping malls! Both the Central and the Peripheral tests are done on an “outpatient” basis. The Central DEXA takes less than 30 minutes, and the Peripheral DEXA lasts about 10 minutes. In the Central DEXA, you lie comfortably on a padded table. No need to remove your clothes – just make sure there are no zippers that might block the x-rays of your hips and spine. Below the bed is the x-ray generator, and above you is the imaging device. The person who performs the test will usually place a small pillow to support your legs. This helps your spine lie flat on the table – the better to get a great image. Also, you may find your foot placed in a brace – this helps keep your hip nice and still during the procedure. The imaging detector will pass slowly over your body. During this time you need to hold your breath, but only for a few seconds. Don’t worry, your tech will guide you through it. The peripheral bone density tests are simpler. You place your finger, hand, forearm or foot in a small device that obtains a bone density reading within a few minutes. There is an additional procedure called Lateral Vertebral Assessment (LVA). An LVA is done at many centers. LVA is a low-dose x-ray examination of the spine, to screen for vertebral fractures and is also performed on the DEXA machine.The LVA test adds only a few minutes to the Central DEXA procedure. The DEXA bone density test usually takes less than 30 minutes, depending on the equipment used and the parts of your body being examined.The technician may ask you to complete a quick questionnaire. This helps the doctor determine if you have osteopenia, osteoporosis or some other medical condition.Your DEXA results will reveal your BMD (Bone Mineral Density)– simply, how healthy your bones are. The report also lists your T-score and Z-score (more on each below). DEXA scans are now the best method of diagnosing and monitoring osteopenia and osteoporosis. The National Osteoporosis Foundation’s guidelines state the following people should be tested with DEXA scans: women over 65; younger postmenopausal women who have any osteoporosis risk factors; and aging men with any osteoporosis risk factors. There are numerous risk factors that can increase your risk of osteoporosis. Below are a few for you to watch out for. If you say, “That’s me” to two or more on this list, it might be a good idea to ask your doctor about a DEXA scan. Women are 2x more likely to develop osteoporosis than men. Due to menopause, estrogen decreases sharply, which accelerates bone loss. For example, in the five to seven years following menopause, a woman can lose up to 20% of her bone density. In our lifetime, we increase bone mass from childhood to about our mid-thirties, when we reach our peak bone mass. From then on, we lose about 1% of our bone every year. “If you don’t use them, you lose them.” Weight-bearing exercise is one of the best things you can do to increase your bone strength because of the concentrated pressure it puts on your bones. A diet lacking in calcium plays a major role in the development of osteoporosis. Eating calcium-rich foods and supplementing with a quality calcium supplement will ensure you are getting the adequate amounts needed. Family History: Having a family member with osteoporosis puts you at greater risk, as osteoporosis is genetic. Women and men who have small body frames tend to have a higher risk for osteoporosis. The following video will show you what getting a DEXA scan is like. It will also tell you what you should wear to your scan to make it more comfortable for you, and easier for the technician. A DEXA scan involves lying down- generally fully clothed- on a scanning table. A scanning arm painlessly and non-invasively scans over your spine, and then over your hips, to help determine the quantity of bone that you have. The results are calculated in a computer, and you’re told your T-score; that’s the result of the bone density test. If your score is between 0 and -1, you are considered normal. If it’s between -1 and -2.49, it’s called low bone mass, or osteopenia. If it’s below -2.5, that’s called osteoporosis. If you are diagnosed with osteoporosis, please don’t be overly worried. A healthy lifestyle together with the right nutrition has proven to increase bone density according to several studies. 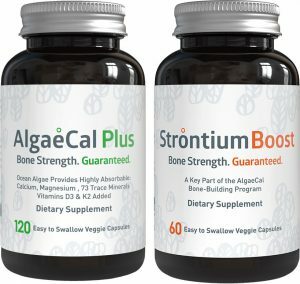 AlgaeCal encourages all current and future customers to measure their bone density with a DEXA scan, and will guarantee an increase in bone mineral density in as little as 180 days by using AlgaeCal Plus and Strontium Boost. Thankfully, as you can see from the chart below, there is very little exposure when compared to numerous other types of medical imaging procedures. For perspective, the amount of radiation emitted that’s listed on the chart above for a DEXA (0.001) is less than what you would get from a New York to L.A. flight. If you go back a few decades, the only place to measure the health of your bones was at a hospital using a Central full body DEXA machine . But to meet the demand for the ever increasing cases of osteoporosis, more affordable, portable machines to test bone density were invented. Due to the wonders of technology, with DEXA machines we can now safely, quickly and painlessly spot a bone density issue far on the distant horizon – and then do something about it – before a bone fracture alerts you to the problem. Nuclear imaging, bone scan 6.3 ? Even after you’ve sat down with your Doctor, who likely explained in great detail what it all meant, you may have gone home and had a follow-up question or forgotten which numbers meant what! And that’s why we’re going to discuss your T- and Z-scores (the main numbers shown after your DEXA scan) so they’re easily understandable. What’s My Z-Score and Why Is It Useful? In technical speak, the Z-score is a measure of the number of standard deviations your bone mineral density is from the average person of your age and gender. An easy way to think about it is that your Z-score helps you see how you’re doing compared to other people in your age range. As you may know, one in two women over age 50 will break a bone because of osteoporosis. So if you’re over 50, the Z-score is a good way to understand how your bone health measures up to people your own age. But when it comes to your overall bone health there is a better indication of how you’re doing. Enter the T-Score. What is a T-Score and What Does it Tell Me? The T-score is a measure of the number of standard deviations your bone density is from a “Young Adult’s” bone density. It gives you an idea of how you compare to someone considered to be at peak bone health. Once you reach your peak bone mass around age 40, you begin to lose 1% of your bone mineral density each year on average. That is why comparing your bone density to a young adult’s is more practical because they are at a lower risk for fractures. The pictures below will give you a visual representation of your scores. For both rows pictured below, the number on the top of each figure is the T-score for the Bone Mineral Density (BMD) that will be reported for any bone density test you’ve taken (Left Femur, Right Femur, Spine, or Total Body). At the bottom of each figure is a “%” score associated with the T-score value. Using a scale of 1 to 100, the “%” score is how your BMD compares to people of your gender in the standard comparison group of “Young Adults” that is used to diagnose osteopenia and osteoporosis. For example, if your T-score was 0.6, your “%” score would be “73%” suggesting that your BMD was better than 73 out of 100 people of your gender in the comparison group and worse than only 26 out of 100. The green figures above indicate above average BMD; the darker the green, the better your BMD. The yellow figures indicate that you are in low bone density territory. 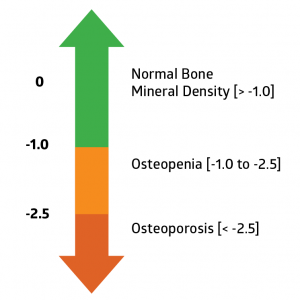 The orange figures indicate Osteopenia (-1.0 to -2.4) , where bone density is below normal and may lead to osteoporosis. The red figures indicate Osteoporosis (-2.5 and below) which is severe bone loss. What’s the Best Way to Measure my Progress? The best way to measure your bone density progress is to track the percentage change in your BMD from your previous DEXA scan. Your T-score is a useful indicator of how your bones compare to someone with peak bone density. But unfortunately there isn’t a standard scoring system for T-score values, so they vary from one clinic to the next. What’s more, T-score percentages can be a little broad, so your T-score may not change even though your bone density may have increased! So the percentage change in your BMD is the best indicator of your progress. Remember, BMD stands for bone mineral density– a measure of the mineral content in a certain volume of your bone. So if you see an increase in your BMD percentage, your bones are getting denser and stronger. A BMD decrease means your bones are becoming more porous and weaker. Note: It’s always a good idea to have a DEXA scan before you start a new bone health regimen like AlgaeCal (within 30 days ideally!) When you have a recent baseline reading, you can more accurately monitor how much impact the new regimen is having. If your baseline DEXA scan is older than 30 days, you won’t have an accurate starting point for comparison. Understanding osteoporosis treatments is vital for you, your family and friends and your caregivers. 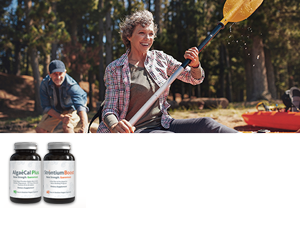 Osteoporosis treatments include a multifaceted regimen of diet, lifestyle habits, and osteoporosis supplements to help prevent (and hopefully reverse) further bone loss and fractures. Fracture Healing: Understand bone fracture healing, the process and more to prevent and treat current fractures. Medications: Doctors often suggest treating osteoporosis with prescription drugs. You must be careful of some of these prescription drugs, due to their serious, negative side-effects. Exercise: Exercise is a crucial aspect for care and treatment of osteoporosis. You should focus on two types of exercise for optimal results. Lifestyle Changes: Treatments can include improved diet, exercise and increased supplementation. The best dietary supplement you can feed your bones will have a combination of calcium with the 13 trace minerals your bones need to grow denser, along with vitamins D3 and K2. As of this writing, the only calcium supplement on the planet with all these ingredients is AlgaeCal Plus. 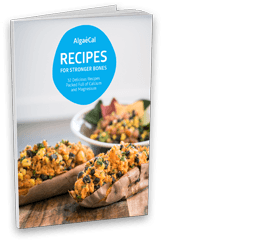 Bone-Building Minerals: If you are concerned about the bone-thinning disease osteoporosis, one treatment you may have heard of and considered is a combination of calcium and strontium. For the most effective treatment – actual increases in bone density – take the plant-based calcium source AlgaeCal Plus. It not only contains natural calcium – from a plant, not a rock – it also includes all the vitamins and minerals your bones need to promote healthy density. Clinical studies prove that it stops bone loss– but even better, increases bone density! Hopefully, you now have a clearer understanding of DEXA scans and why they’re so important. It’s a good idea to ask your doctor about getting a DEXA scan if you fall into any of the categories listed in the “Who Should Get a DEXA Scan?” section above. If you find you do have low bone density (any T-score -0.1 and below) or have been diagnosed osteopenic or osteoporotic, you should take the appropriate steps to combat that. Plus, when you take AlgaeCal Plus and Strontium Boost together, you’ll consistently see increasing T-scores on your DEXA scans, year after year. How do you check bone density? The only truly accurate way to check your bone density is with a DEXA scan. Regular x-rays will not give you the details (T-score and Z-score) your doctor needs to make an accurate diagnosis. What is the actual name of the bone density test? DEXA (or DXA) stands for Dual Energy X-Ray Absorptiometry. There are two types: Central and Peripheral. The first covers your entire skeleton; the second focuses on your extremities, such as your hands or feet. How much does it cost for a bone density test? In the US, Medicare covers the cost of your DEXA scan every two years. If you need more scans, please check with your insurance provider for complete coverage details. In Canada, the Federal Government says that if you’re 65 and never had a DEXA, Canadian Medicare will cover it. They’ll also let you do follow-up DEXAs if you need them, every 2 years and cover them. Sometimes, if your treatments are annual, Medicare will cover the cost. If your health insurance does not cover the cost of your DEXA scan, you will have to pay out of pocket. More coming soon, if you would like to see your DEXA scan clinic listed here please contact us. I have a metal plate/object in my body (head, arm, leg etc. ), is it still safe/effective to have a body composition scan? Yes. Since the metal object will be present in both initial and future scans, the readings will still be helpful since there is no change in the object. The metal will not greatly affect readings. A DEXA scan’s beams can’t interact with the metal object like an MRI machine’s will, so while the surrounding tissue will be classified incorrectly as bone, readings will still be consistent from scan to scan.